This multidisciplinary project combines the design, synthesis, fine physico-chemical characterization, and modeling of polymeric materials exhibiting several levels of porosity. More specifically, the fundamental question regarding the role of each porosity level on the transport properties of such porous frameworks is investigated. Such materials may be dedicated to various applications in civil engineering areas, e.g. waste disposal and insulation materials, or in soil mechanics and biomechanics. The synthesis of these innovative porous materials is performed at the ICMPE laboratory. It mainly consists in the preparation of bi- or multiporous poly (2-hydroxyethyl methacrylate) (PHEMA) samples through various strategies involving macro- and nanoporogens. The first method involved a double porogen templating approach. The nanoporosity level was produced via a phase separation phenomenon that occurred during the free-radical copolymerization of the comonomers (HEMA and EGDMA) in the presence of a porogenic solvent (propan-2-ol). To generate the macroporosity, a versatile strategy was implemented through the use of sodium chloride (NaCl) macro-sized particles. 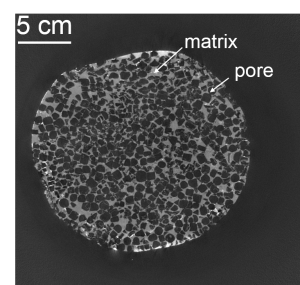 Nanoporous network with pore size ranging from 10 nm to 10 µm was observed while macropores had an average diameter of about 100 µm as evidenced by Mercury Intrusion Porosimetry (MIP) and Scanning Electron Microscopy (SEM). Several parameters as macroporogen size and packing were varied in order to control the pore size and connectivity. 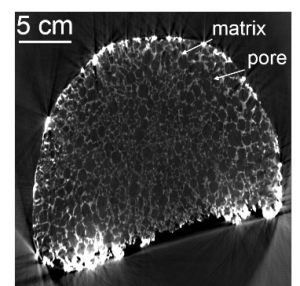 To study the effect of macroporogen packing, NaCl particles were fused by Spark Plasma Sintering technique prior to the generation of poly (HEMA-co-EGDMA) network. After porogen removal, an increase in the porosity ratio resulting from an increase in macroporogen packing was observed. The macroporogen size effect on the porous materials was also studied by varying the NaCl particles size from 125 µm to 400 µm. The MIP profile showed an increase in pore size and porosity ratio in correlation with the increase in macroporogen size. Furthermore, sintered PMMA beads were also used as macroporogens to tune the pore shape. Sintering temperature were varied from 50°C to 140°C but only a temperature of 70 °C enabled to obtain an effective packing. A second approach was investigated to design multiporous materials through the use of high internal phase emulsions polymers (poly(HIPE)s) for the preparation of porous crosslinked PHEMA. The aim was to generate an additional porosity level by hyper-crosslinking of polyHIPEs. Such materials were successively functionalized by carbonyldiimidazole (CDI) and allylamine (or propargylamine). The last step involved thiol-ene (or thiol-yne) reaction. Water permeability properties are currently studied (NAVIER laboratory, Siavash Ghabezloo) and compared to those obtained by numerical calculations (MSME laboratory). Interestingly, X-ray microtomography analysis is also performed to visualize porous materials microstructure and to reconstruct 3-D shape and pore interconnectivity (NAVIER laboratory) (Figure 1). Figure 1. X-ray microtomography pictures of doubly porous PHEMA-based materials obtained upon sintered (a) and non-sintered (b) NaCl particles templates.